You may have noticed the display at the shop of scissor fobs and pins. The pins can be used to attach your pattern to your work as you stitch. Used as a counting pin. Look cute in a pin cushion or adorn a finished piece. Each is made of glass beads and metal findings. The pins are not just your everyday pin. They are extra long and have a wonderful pewter patina to them. Very vintage looking. With a fob on your scissors there is no confusion which pair are your. Our stitching table gets quite crowded, but everyone know which scissors are theirs when it is time to pack up and go home. I just love the whole display. Comments Off on Dragonfly bag.. This was a busy weekend. I finished my gardens and then planted the stores beds. In the down time I beaded. If you have stitched our “Dragonfly Dreams” designed by Carolyn you will recognize this fabric . We designed it so that when it is drawn together it looks like a flower and the ties are adorned with crystal dragonflies. They are just beautiful. I think that they will go fast, and when they are gone they are gone forever…. 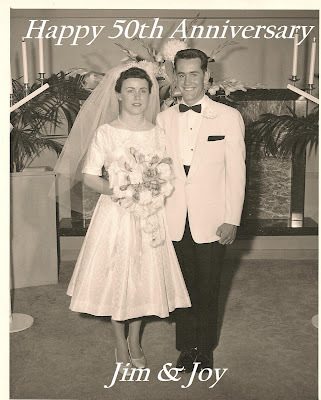 Joy and her husband (my in-laws) just celebrated 50 years together! Can you believe it. We had a nice quiet family celebration, because Jim likes things low key. This picture however was 4 feet by 3 feet and posted at the entrance to their neighborhood and then showed up for our dinner reservations. I don’t think Jim enjoyed that very much. Congratulations! We love all of our customers, but this couple I just have to share with you. As they shopped the store their dog was very comfortable to be packed around in the bag his owner wore. In visiting with them they asked if we knew where they could find goggles for the dog. Okay, now we just had to know more…The dog rides everywhere with them in the bag on the front of a Harley! What a great couple! We hope to see them again soon.